KiDS, the Kilo-Degree Survey, is a large optical imaging survey in the Southern sky, designed to tackle some of the most fundamental questions of cosmology and galaxy formation of today. Using the VLT Survey Telescope (VST), located at the ESO Paranal Observatory, KiDS will map 1500 square degrees of the night sky in four broad-band filters (u, g, r, i). The fourth public data release (DR4) of KiDS is as now available. This new release supercedes all previous releases and provides reprocessed pixel and catalog data products for a total of 1006 survey tiles, or roughly 1000 square degrees of the sky. New in the DR4 multi-band catalog is the inclusion of near-infrared VIKING data, thus providing photometric measurements for a total of 9 broadband filters (ugriZYJHK). Further details, the release notes, and data access information can be found on the DR4 website. The first cosmological measurement based on a combination of KiDS (optical) and VIKING (infrared) data has been presented in Hildebrandt et al. (2018). The area (450 sq.deg. ), depth, and wavelength coverage of this first KiDS+VIKING data set make it the most extensive optical+infrared data set ever used for lensing measurements. Based on greatly enhanced photometric redshifts and new image simulations (Kannawadi et al. 2018) this analysis updates the KiDS-450 cosmology results from Hildebrandt et al. (2017) and significantly increases the systematic robustness. We use 450 sq. deg. of KiDS imaging data to measure the weak gravitational lensing shear power spectrum with a quadratic estimator in two and three redshift bins. The cosmological parameter that is best constrained by the cosmic shear power spectrum data is a combination of the total matter density Ωm and the clustering amplitude σ8 called S8=σ8*&Sqrt;(Ωm/0.3). The constraints derived for this analysis confirm the recently reported tension in this parameter combination with constraints from the Planck cosmic microwave background probe at 3.2σ (we compare also to other data sets in the Figure). The 1σ constraints on the parameter combination S8 for our fiducial model using 2 and 3 redshift bins. We compare them to constraints from other cosmic shear and CMB analyses. For cosmic shear analyses we indicate the type of estimator used with 'CF' for correlation functions and 'QE' for the quadratic estimator. The first galaxy cluster catalog from KiDS, based on the DR2 data set, has been published in Radovich et al. (2017, A&A, 598, A107). Accompanying the paper is a catalog of 1585 candidate clusters, extending to a redshift of 0.7, and shown to be 85% complete, with an estimated purity of 80%. This catalog can be downloaded from the cluster catalog webpage linked below. The tools (developed by F. Bellagamba, M. Maturi and M. Roncarelli) that have been used to harvest the KiDS data for galaxy clusters and presented in this paper, have also been selected for use by the upcoming ESA Euclid satellite mission. Central 2 arcsecond region of the cluster Abell 1411, one of the rich clusters present in the KiDS DR2 area. 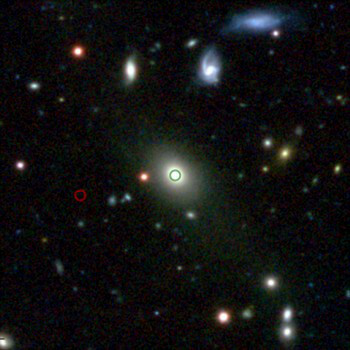 This color image was made from KiDS u-, g- and r-band data and shows the Brightest Cluster Galaxy, indicated by the green circle; the red circle shows the cluster center reported in the Abell catalog. Images from the Kilo-Degree Survey (KiDS) are now included in the Galaxy Zoo citizen science project, where anyone can help classify galaxies and contribute to our astronomical knowledge. Currently, for over 11,000 galaxies, selected based on a galaxy catalog from the GAMA survey, color images from KiDS g-, r- and i-band data are available. This data set will later on be extended step-wise to over 40,000 galaxies. The high quality KiDS images will allow us to study the very faintest structures within galaxies, as well as more accurately classify features which may have been missed before. → Blog post: New images for Galaxy Zoo from GAMA-KiDS! The weak lensing shear catalog for the KiDS-450 / DR3 data set, covering 454 KiDS survey tiles is now publicly available. This data set serves as the basis for the cosmic shear analysis presented in Hildebrandt &AMP; Viola et al. (2017) and various more scientific analyses currently in preparation. Available both via ESO and CADC, the catalog provides accurate shear measurements and photometric redshifts for over 15 million galaxies. Analysis of 450 square degrees of the Kilo-Degree Survey (KiDS), made with ESO's VLT Survey Telescope in Chile, suggests that dark matter may be less dense and more smoothly distributed throughout space than previously thought. An international team studied how the light from about 15 million distant galaxies was affected by the gravitational influence of matter on the largest scales in the Universe. The results appear to be in disagreement with earlier results from the Planck satellite. Press releases highlighting these results can be found via the Press releases page. Dark matter map of KiDS survey region (region G15). Credit: Kilo-Degree Survey Collaboration/H. Hildebrandt & B. Giblin/ESO. The third public data release (DR3) of KiDS is as now available. Adding 292 survey tiles to the previous releases, DR3 brings the total number of released tiles to 440. New features in the DR3 multi-band catalog, which covers the combined survey area of DR1, DR2 and DR3, are Gaussian Aperture and PSF (GAaP) photometry, survey photometric homogenization, and photometric redshifts. Further details, the release notes, and data access information can be found on the DR3 website. Based on 450 square degrees of imaging, we have obtained the first cosmological parameter constraints from KiDS. The main result is shown in the Figure, in the form of constraints on the σ8 - Ωmatter plane. Interestingly, and in common with many other low-redshift probes, the best-fit values show a discrepancy with the expectation from Planck cosmology. Further studies are underway. 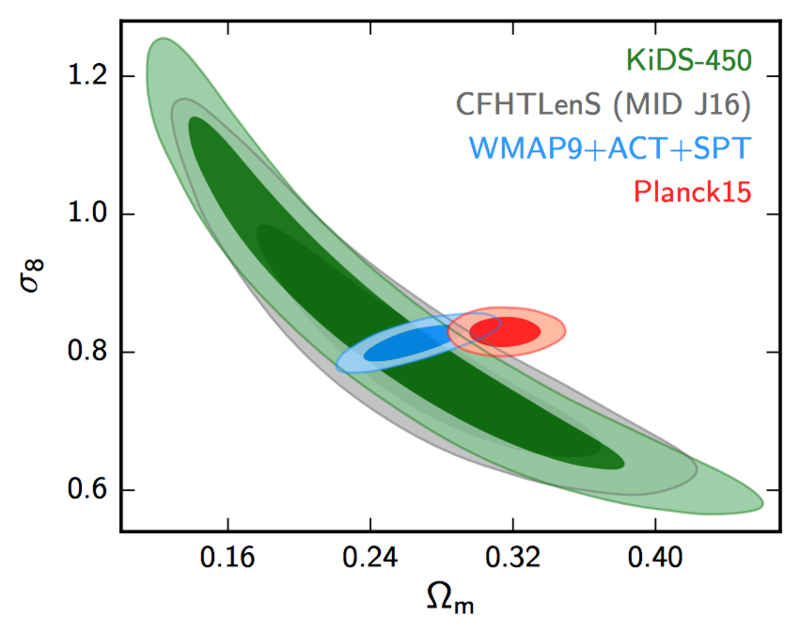 Constraints in the Ωm vs. σ8 plane from KiDS-450 cosmic shear tomography (green) in comparison to CFHTLenS (gray), WMAP9+ACT+SPT (blue), and Planck 2015 (orange). Dutch broadcasting corporation VPRO interviewed Leiden University Phd student Margot Brouwer about her work on KiDS. The article, which is only available in Dutch, has been published in the VPRO tv guide, but can also be downloaded below. On Thursday May 19th at 19:20 CEST, a related documentary focused on the nature of Dark Matter will be broadcast on Dutch public tv station NPO2. Today the first scientific results from the Kilo-Degree Survey have been published. 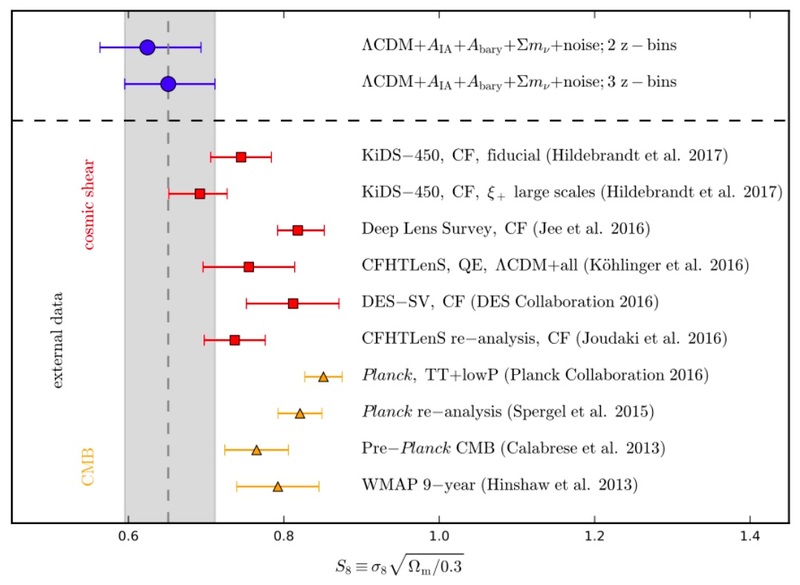 Among the first batch of papers are early weak gravitational lensing analyses, demonstrating the power of the superb image quality of KiDS for this type of research. 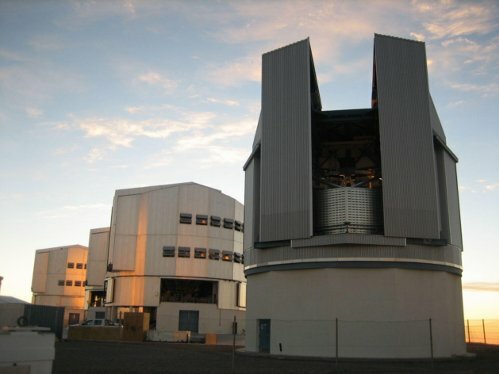 Other results presented include the discovery of four high-redshift quasars, a sample of super-compact massive galaxies, and a catalog of photometric redshift based on machine learning techniques. Links to the papers are provided on the Papers page, and press releases highlighting these first results can be found via the Press releases page. With the announcement of the first weak lensing analyses using KiDS data, the weak lensing shear catalogs are also released. The area covered is the overlap of the combined data set of the first two KiDS public data releases with the equatorial regions covered by the GAMA survey. Shear measurements are made using a dedicated pipeline using THELI and Lensfit, while the included photometry and photometric redshifts are derived from the DR1/2 coadded images using image gaussianization and Gaussian-weighted aperture photometry. Please visit the Lensing catalogs page for details and data access. The second public data release of KiDS (KiDS-ESO-DR2) is available. It contains calibrated, stacked images and their weights, masks and single-band source lists for 98 square degrees, as well as a multi-band source catalog encompassing the 150 square degrees of the first two KiDS data releases combined. All data are available via the ESO archive facility, as well as via the AstroWISE Information System. Please visit the KiDS Data Release 2 pages for details and data access.